An uncertain crowd could only look on in horror at the moment a tiger had a fit and collapsed after being forced to jump through a flaming hoop. The six-year-old big cat, called Zena, was part of a show being led by brother-sister duo Artur and Karina Bagdasarov at the circus in Magnitogorsk, Russia. 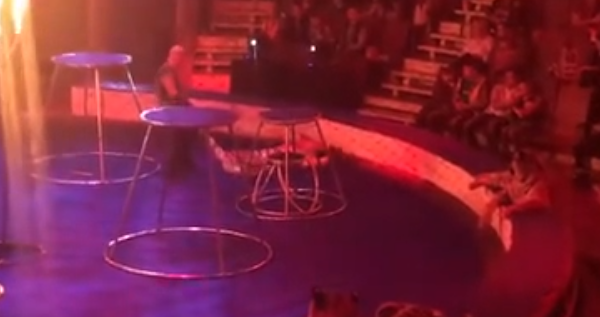 The shocking video shows the tigress convulsing on the side of the ring, clearly in a great deal of pain. All the while Artur uses a long stick as a whip to keep six performing tigers from coming nearer. In an attempt to jolt the collapsed tigress, Artur pours water over poor Zena, before dragging her from the ring by the tail. Since the incident, the pair have been accused of animal cruelty but have defended their methods, saying the stick was necessary as they ‘feared the six other tigers would attack Zena’. Karina said: “Artur did his best to bring Zena back to her senses and he did all the right things – he touched her reflexive zones, he poured water on her. “The main thing was to stop other animals from attacking. For them a weak animal is a target, it is an order to kill. In the video Zena does eventually come round after suffering what is believed to be an ‘epileptic fit’. 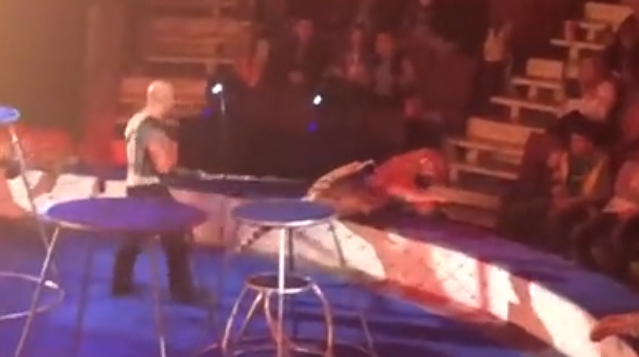 Artur went on to say he had no choice but to pull Zena by the tail, explaining: “I had to drag the animal away from the wire fence, she was about to fall between the stage and the wire. I dragged her to a safe place where there were no other tigers around. “Any other tiger could have attacked her when she was so weak. Karina was controlling six animals so they did not do any harm to the tigress. “So the tigress was away from spectators and away from other tigers. Why the tail? What else could I drag her by? She has claws on her paws. She is not a soft cat. I could not lift the whole tiger. Artur added that he had shouted for the music and microphones be turned off during Zena’s fit. The crowd cheered with relief when Zena finally stood up – but some onlookers said there had been cruel laughter too. A spectator named Larissa, who had taken her two children to the circus, said: “When the tiger was convulsing, spectators laughed. When the animal defecated, it became clear it was an attack of an illness. “Both animal trainers behaved normally, the sister [Karina] was watching the other animals. The brother controlled everything and helped the tigress. The whole ordeal must’ve been awful for the tigers – this should certainly reignite the ongoing debate as to whether animals should be subjected to circus life.